Connie performed two songs at a street charity event in Gangnam, Seoul. It was a concert in aid of the national 'Sharing Hope 2009 Campaign' - it used a cherry logo for promo badges etc. Connie performed at a Mini Showcase on the La Qua Stage in Tokyo's Dome city. She sang Over The Rainbow, Wonderful World, I Will Always Love You, and Favorite Things (acapella). As ambassador for the Toys for Tots program, Connie performed at the National Toys for Tots Campaign 2009 Kick-Off Luncheon at the Hilton Alexandria (Va.) Mark Center on her ninth birthday, Nov 20, 2009. 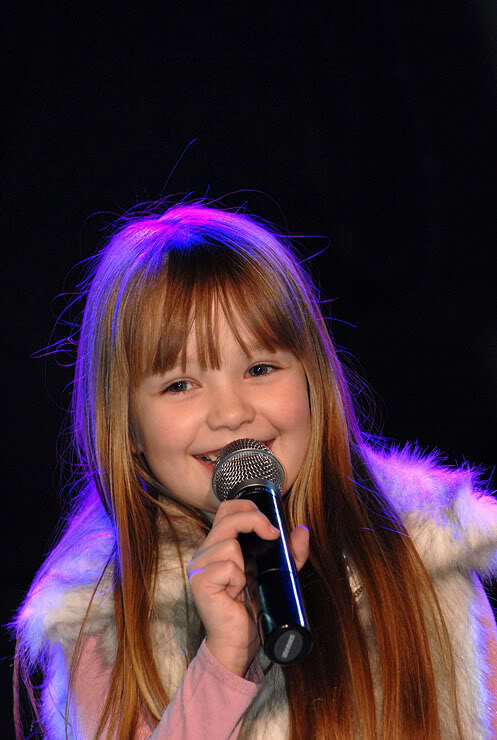 Connie Talbot performs on the stage during BTV Global Spring Festival Gala recording on January 11, 2011 in Beijing, China. Young Voices has staged the largest children's choir concerts in the world. Guinness World Record : The most backing singers to one vocalist was 6,031 and was achieved by Young Voices (UK) accompanying Connie Talbot (UK) at The O2 Arena, London, UK, on 6 March 2012. Connie Talbot performed her own version of Run (originally by Snow Patrol) with a 7 piece band led by conductor David Lawrence. The running time of the performance was 5 minutes 6 seconds. The Young Voices backing singers performed basic dance moves as part of their performance to an audience of 8,929 people. Also Connie Talbot graced the number 1 Noontime show in the Philippines 'Eat Bulaga' on December 17-Monday, as she sang 'Somewhere Over The Rainbow' and had little chat and dance with little Ryzza . Eat Bulaga holds the record of being the longest-running noontime variety program on air in the history of local television. Connie visit Jakarta for the promotion of her new album Beautiful World. Few hours after her arrival Connie visit Blossom Lestari Orphanage (second photo / © kapanlagi.com). There Connie donate some stuff and share the joy together, not stingy she was singing "Somewhere Over The Rainbow" and also eat with the orphans. Connie Talbot weve radiated joy on her face, and talk every chance she kept smiling and laughing. Then Connie singing performance at the Little Stage Indola 2012 in studio 1 RCTI, Kebon Jeruk, Jakarta (first photo / © antarafoto). Also Connie appeared in performances Mini Show Disney Princess Pageant at Central Park, Jakarta, (third photo / @ConnieTalbot_ID) and had a meet and greet with conniefriends. Tribute to Connie, her love for African children and in recognition for the great friendship that has grown between her and the African Children's Choir, Connie gets a great tribute and an incredible honour bestowed.